Can You Get Away With a Foul Early in the Match? 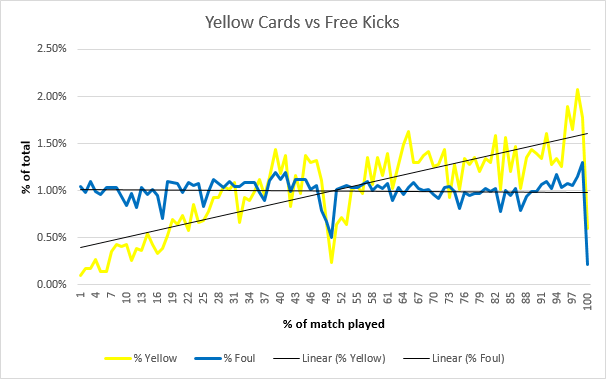 While free kicks are spread out evenly over the duration of the match, the amount of yellow cards increases steadily as the game goes on. This suggests that the chance of getting a card when you concede a free kick increases as well. Unless fouls are in fact steadily getting more reckless, it doesn’t seem like they are judged entirely on their own merits. Of course there are different reasons for a referee to give a free kick or yellow card. I’ve looked at minute-by-minute data of every Premier League match since 2009/2010 from whoscored.com, which provides a description along with every free kick or yellow card event. The distinctions made in these descriptions are not terribly specific, but it goes as long way. You can see the same increase in cards as in the previous graph, but it’s clear that the composition changes over time. 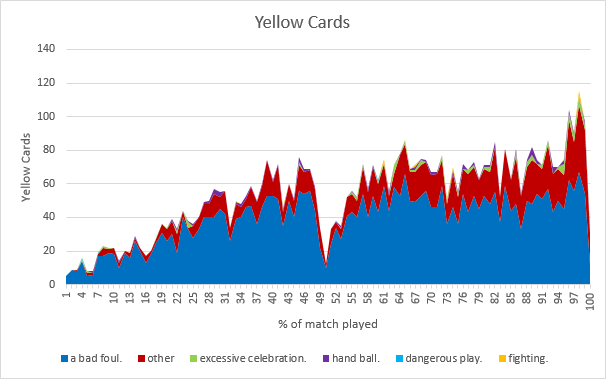 The share of yellow cards for unspecified reasons (“other”) increases from almost non-existent to close to half of all cards. I can only assume that these are mostly for things like time-wasting, kicking the ball away, dissent, etc., which become more of an issue later in the match. For the most part this explains the increase in the second half, but it still doesn’t explain what happens in the first. A possible answer can be found in the official rules, which state that “persistent infringement of the Laws of the Game” is also a cautionable offence. That means fouls don’t actually have to be judged on their own merits and it makes sense to look at the amount of fouls committed by the player that receives the yellow card as well. Now it’s clear that the chance of getting a card for a single foul is fairly consistent during three quarters of the match, but the opening stages are still an anomaly. The only other explanation I can think of is that referees are conscious of the fact that a card early in the match is a harsher punishment than a card later in the match. In my previous article I calculated this effect for red cards, and to a certain extend it must be true for yellow cards as well. Players already on a yellow run the risk of getting a second and will be more careful making fouls in the rest of the match. The numbers show that on average, a player receiving a yellow card will have made 0.59 previous fouls and will only make another 0.36 fouls in the rest of the match. Of course this is skewed by the fact that the average yellow is given after 59% of the match. If we correct for that it’s 0.5 vs 0.42. It’s a minor effect, but it’s there. To be certain I’ve also looked at hand balls, which I expect will be judged on their own merits. Free kicks given for hand balls are evenly spread out as well, but the risk of getting a yellow for it is 60% higher in the second half than in the first. All things considered it looks like it’s true: it is easier to get away with a foul early in the match.